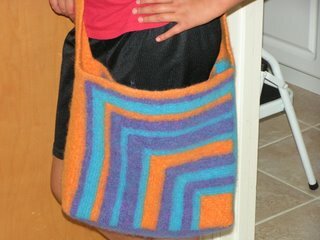 I'm so excited - I have finally finished my mitred square tote for my Tote Exchange www.toteexchange.blogspot.com partner. 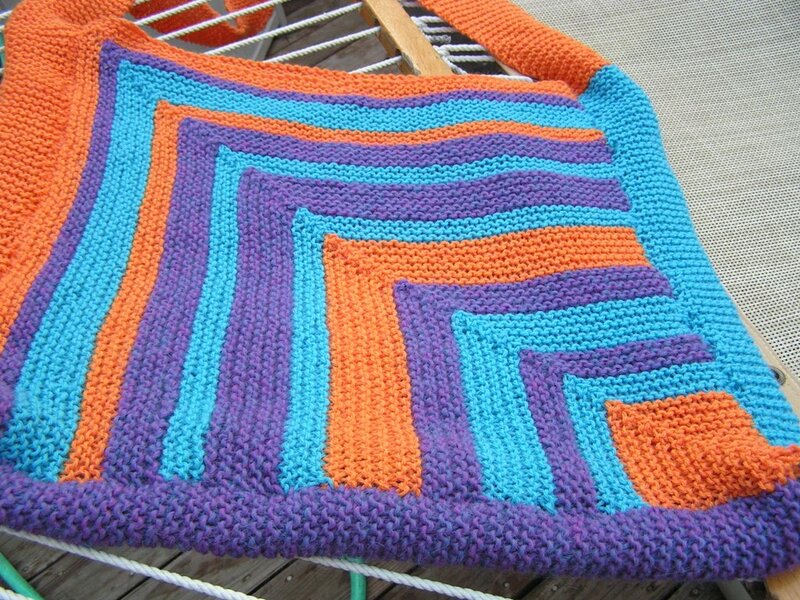 It was a lot of fun to knit the front and back mitred squares. I chose this pattern because I've always wanted to try mitred squares but until now I was afraid they would be too hard. They couldn't be easier! And the fun part is that they get smaller every other row so the knitting goes very quickly. Now the band - well that was another story. You knit two identical squares - one for the front and one for the back. Then you knit "the band" which started with the orange side, went up to become the strap and then became the blue side and the purple bottom. The knitting went on FOREVER! I even shortened the handle from what they said to knit but it still went on and on and on! 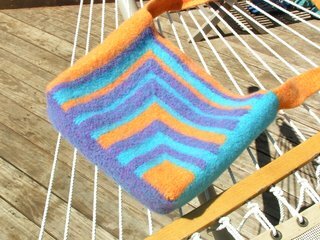 That is the one modification I'd make if I do this again - I'd make the handle shorter and possibly double the yarn when doing the handle to make it thicker. I think I will make it again because I really like how it turned out. I used Cascade 22o and cast on the 125 stitches the pattern called for but boy was this sucker big! Both of these photos are taken on the same hammock to give you an idea of scale. To bring it back from the Land of the Giants I felted it a lot and it shrunk down nicely. 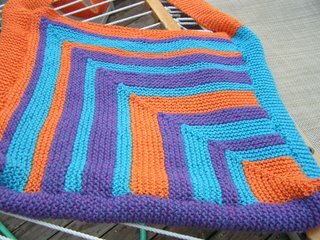 It's still on the large side - more of a tote or knitting bag than a purse - but I like it and hopefully my pal will too. Here it is being modeled by the lovely Miss K. It hits her fairly low but then she's not that tall yet. On me it hits perfectly if you sling the strap across your body and a little on the low side if you just put it over your shoulder. I'm hoping if my pal thinks it's too long maybe she could fold the top and put a cute pin on it to make it shorter. Anyway - I can't wait to see what my secret pal sends to me! Your tote looks really pretty. I'm sure your pal will love it! Hi Allison, I love this bag! What yummy colors and such a great pattern too. Hey, I see you live in Palo Alto! That is my home town! Talk about a small world. I was there for a walk down memory lane last summer and I was swept with bittersweet heartache. Some things have changed but some haven't. I had lunch at Ming's and went by the old address on Bruce St off Middlefield Rd. I even went by the Buddist Temple which is right around the corner from my childhood home. Oh how I miss Paly! Isn't it funny how many of us decided to try a pattern we were intimidated by in the past or had always been fascinated by but hadn't ever used?! Your bag came out great!! Your partner will love it! Love Love Love the bag.. It turned out great..I want the pattern I want the colors I want to make that bag!!! Its great!! Awesome job. That bag is right up my alley.